Let's make the best of it! and you can improve upon anything. 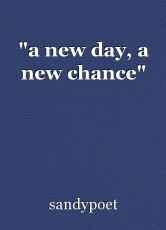 With a new day comes a new chance to begin. It's a way for you to start all over again. Wonderfully written..Sandy I am always in seek of such poems which makes my day..And ur write really moved me from within. Thanks dear..